Now that we’ve go that out of the way, we turn to The Magician. 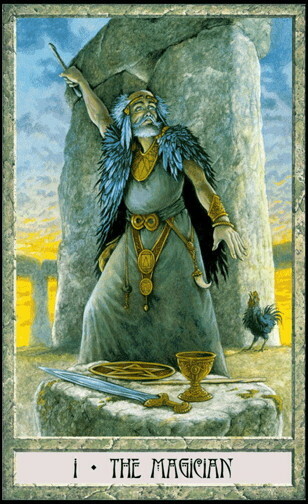 The card speaks for itself as we see a young man whose intention is to be a vessel between the Divine and the world. According to Arthur Waite, the infinity symbol above his head stands for “the Holy Spirit, the sign of life.” The Magician is one who desires to manifest this Spirit power in his/her life and the world around them. 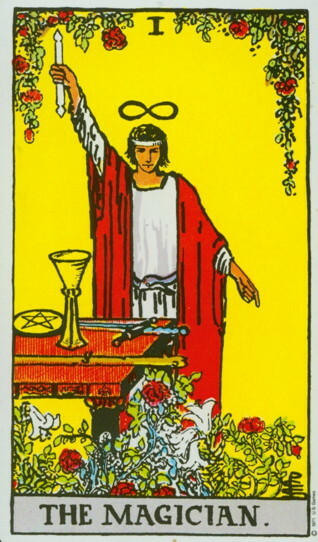 On the table are the symbols of the four suits of the Tarot: Wands, Swords, Cups and Pentacles. Each of these corresponds to one of the four basic elements of nature: Air, Fire, Water and Earth respectively. NOTE: I always read Wands as Air and Swords as Fire. Many people flip these two and there is a lot of impassioned debate regarding this subject. My suggestion is to use whichever makes sense to you! Furthermore the Pentacle is NOT a sign of the Devil. With the tip of the star pointing up, it is an ancient symbol that represents the four elements plus spirit. This symbol, above all others, has been greatly misunderstood by many Christians. The Magician’s belt is a snake swallowing its tail. It’s called an “ouroboros” and is an ancient symbol for something that constantly recreates itself. (Google it!) It is a sign of the cyclical nature of things and first emerged in Ancient Egypt and India. It can also be found in Christian Gnosticism. It is connected with the “alchemist” who, in the Middle Ages, worked intimately with the natural world. They are the forerunners to the modern field of chemistry. When this card appears, it always makes me smile. It tells me it’s time to focus my energy and concentrate on higher things. It’s time to open myself up to the power of inspiration and Spirit and let them flow through me and into the world. The Magician carries with it great responsibility as well. Some Wiccans believe in the Rule of Three which means whatever energy we put out into the world comes back to us threefold. Therefore, whatever magic we manifest must be for the highest and greatest good. I’m not sure what the Christian version of the Rule of Three is, but Jesus told his followers to “love your enemies and pray for those who persecute you.” (Mt 5:44) Therefore magic, prayers, etc. should always be done with a spirit of love and never in anger or in order to seek revenge. This entry was posted in Tarot and tagged Christian, Pagan, Tarot, Wicca. Bookmark the permalink.